The explanation proposed by Singer and Nicolson is called the fluid mosaic model. The model has evolved somewhat over time, but it still best accounts for the structure and functions of the plasma membrane as we now understand them. The fluid mosaic model describes the structure of the plasma membrane as a mosaic of components—including phospholipids, cholesterol, proteins, and carbohydrates—that gives the membrane a fluid character. Plasma membranes range from 5 to 10 nm in thickness. For comparison, human red blood cells, visible via light microscopy, are approximately 8 µm wide, or approximately 1,000 times wider than a plasma membrane. The membrane does look a bit like a sandwich ([link]). The fluid mosaic model of the plasma membrane describes the plasma membrane as a fluid combination of phospholipids, cholesterol, and proteins. Carbohydrates attached to lipids (glycolipids) and to proteins (glycoproteins) extend from the outward-facing surface of the membrane. The principal components of a plasma membrane are lipids (phospholipids and cholesterol), proteins, and carbohydrates attached to some of the lipids and some of the proteins. A phospholipid is a molecule consisting of glycerol, two fatty acids, and a phosphate-linked head group. 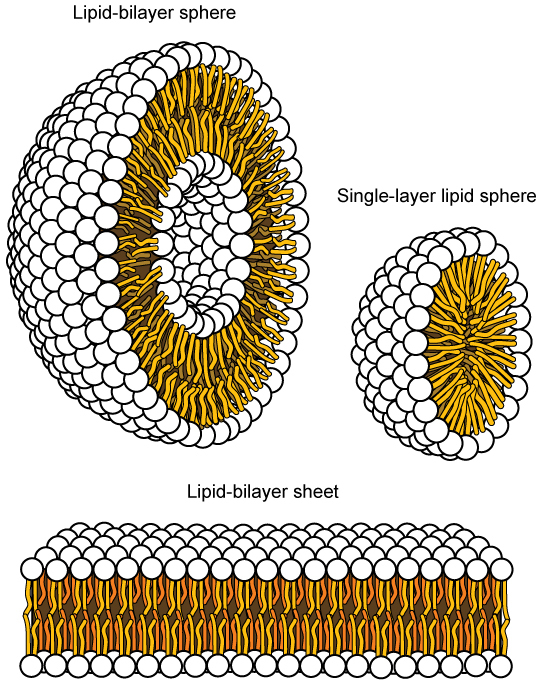 Cholesterol, another lipid composed of four fused carbon rings, is found alongside the phospholipids in the core of the membrane. The proportions of proteins, lipids, and carbohydrates in the plasma membrane vary with cell type, but for a typical human cell, protein accounts for about 50 percent of the composition by mass, lipids (of all types) account for about 40 percent of the composition by mass, with the remaining 10 percent of the composition by mass being carbohydrates. However, the concentration of proteins and lipids varies with different cell membranes. For example, myelin, an outgrowth of the membrane of specialized cells that insulates the axons of the peripheral nerves, contains only 18 percent protein and 76 percent lipid. The mitochondrial inner membrane contains 76 percent protein and only 24 percent lipid. The plasma membrane of human red blood cells is 30 percent lipid. Carbohydrates are present only on the exterior surface of the plasma membrane and are attached to proteins, forming glycoproteins, or attached to lipids, forming glycolipids. The main fabric of the membrane is composed of amphiphilic, phospholipid molecules. The hydrophilic or “water-loving” areas of these molecules (which look like a collection of balls in an artist’s rendition of the model) ([link]) are in contact with the aqueous fluid both inside and outside the cell. Hydrophobic, or water-hating molecules, tend to be non-polar. They interact with other non-polar molecules in chemical reactions, but generally do not interact with polar molecules. When placed in water, hydrophobic molecules tend to form a ball or cluster. 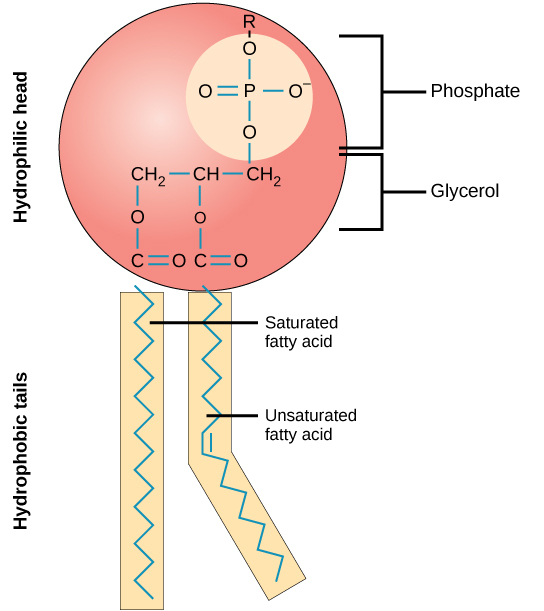 The hydrophilic regions of the phospholipids tend to form hydrogen bonds with water and other polar molecules on both the exterior and interior of the cell. Thus, the membrane surfaces that face the interior and exterior of the cell are hydrophilic. In contrast, the interior of the cell membrane is hydrophobic and will not interact with water. Therefore, phospholipids form an excellent two-layer cell membrane that separates fluid within the cell from the fluid outside of the cell. This phospholipid molecule is composed of a hydrophilic head and two hydrophobic tails. The hydrophilic head group consists of a phosphate-containing group attached to a glycerol molecule. The hydrophobic tails, each containing either a saturated or an unsaturated fatty acid, are long hydrocarbon chains. This characteristic is vital to the structure of a plasma membrane because, in water, phospholipids tend to become arranged with their hydrophobic tails facing each other and their hydrophilic heads facing out. In this way, they form a lipid bilayer—a barrier composed of a double layer of phospholipids that separates the water and other materials on one side of the barrier from the water and other materials on the other side. In fact, phospholipids heated in an aqueous solution tend to spontaneously form small spheres or droplets (called micelles or liposomes), with their hydrophilic heads forming the exterior and their hydrophobic tails on the inside ([link]). Proteins make up the second major component of plasma membranes. Integral proteins (some specialized types are called integrins) are, as their name suggests, integrated completely into the membrane structure, and their hydrophobic membrane-spanning regions interact with the hydrophobic region of the the phospholipid bilayer ([link]). Single-pass integral membrane proteins usually have a hydrophobic transmembrane segment that consists of 20–25 amino acids. Some span only part of the membrane—associating with a single layer—while others stretch from one side of the membrane to the other, and are exposed on either side. 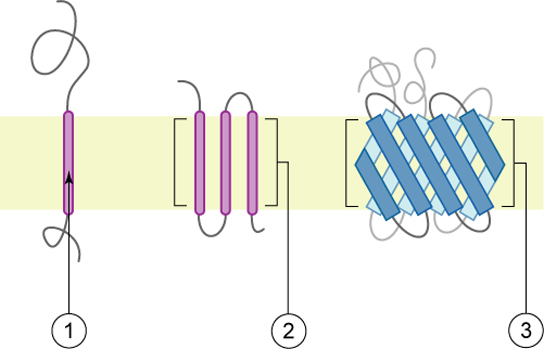 Some complex proteins are composed of up to 12 segments of a single protein, which are extensively folded and embedded in the membrane ([link]). This type of protein has a hydrophilic region or regions, and one or several mildly hydrophobic regions. This arrangement of regions of the protein tends to orient the protein alongside the phospholipids, with the hydrophobic region of the protein adjacent to the tails of the phospholipids and the hydrophilic region or regions of the protein protruding from the membrane and in contact with the cytosol or extracellular fluid. Peripheral proteins are found on the exterior and interior surfaces of membranes, attached either to integral proteins or to phospholipids. Peripheral proteins, along with integral proteins, may serve as enzymes, as structural attachments for the fibers of the cytoskeleton, or as part of the cell’s recognition sites. These are sometimes referred to as “cell-specific” proteins. The body recognizes its own proteins and attacks foreign proteins associated with invasive pathogens. Carbohydrates are the third major component of plasma membranes. They are always found on the exterior surface of cells and are bound either to proteins (forming glycoproteins) or to lipids (forming glycolipids) ([link]). These carbohydrate chains may consist of 2–60 monosaccharide units and can be either straight or branched. Along with peripheral proteins, carbohydrates form specialized sites on the cell surface that allow cells to recognize each other. These sites have unique patterns that allow the cell to be recognized, much the way that the facial features unique to each person allow him or her to be recognized. This recognition function is very important to cells, as it allows the immune system to differentiate between body cells (called “self”) and foreign cells or tissues (called “non-self”). Similar types of glycoproteins and glycolipids are found on the surfaces of viruses and may change frequently, preventing immune cells from recognizing and attacking them. How Viruses Infect Specific OrgansGlycoprotein and glycolipid patterns on the surfaces of cells give many viruses an opportunity for infection. HIV and hepatitis viruses infect only specific organs or cells in the human body. 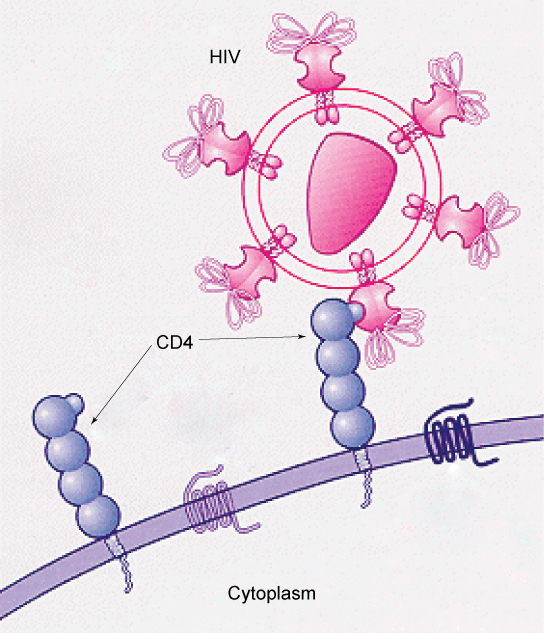 HIV is able to penetrate the plasma membranes of a subtype of lymphocytes called T-helper cells, as well as some monocytes and central nervous system cells. The hepatitis virus attacks liver cells. These viruses are able to invade these cells, because the cells have binding sites on their surfaces that are specific to and compatible with certain viruses ([link]). Other recognition sites on the virus’s surface interact with the human immune system, prompting the body to produce antibodies. Antibodies are made in response to the antigens or proteins associated with invasive pathogens, or in response to foreign cells, such as might occur with an organ transplant. These same sites serve as places for antibodies to attach and either destroy or inhibit the activity of the virus. Unfortunately, these recognition sites on HIV change at a rapid rate because of mutations, making the production of an effective vaccine against the virus very difficult, as the virus evolves and adapts. A person infected with HIV will quickly develop different populations, or variants, of the virus that are distinguished by differences in these recognition sites. This rapid change of surface markers decreases the effectiveness of the person’s immune system in attacking the virus, because the antibodies will not recognize the new variations of the surface patterns. In the case of HIV, the problem is compounded by the fact that the virus specifically infects and destroys cells involved in the immune response, further incapacitating the host. The mosaic characteristics of the membrane explain some but not all of its fluidity. There are two other factors that help maintain this fluid characteristic. One factor is the nature of the phospholipids themselves. In their saturated form, the fatty acids in phospholipid tails are saturated with bound hydrogen atoms. There are no double bonds between adjacent carbon atoms. This results in tails that are relatively straight. In contrast, unsaturated fatty acids do not contain a maximal number of hydrogen atoms, but they do contain some double bonds between adjacent carbon atoms; a double bond results in a bend in the string of carbons of approximately 30 degrees ([link]). ImmunologistThe variations in peripheral proteins and carbohydrates that affect a cell’s recognition sites are of prime interest in immunology. These changes are taken into consideration in vaccine development. Many infectious diseases, such as smallpox, polio, diphtheria, and tetanus, were conquered by the use of vaccines. Immunologists are the physicians and scientists who research and develop vaccines, as well as treat and study allergies or other immune problems. Some immunologists study and treat autoimmune problems (diseases in which a person’s immune system attacks his or her own cells or tissues, such as lupus) and immunodeficiencies, whether acquired (such as acquired immunodeficiency syndrome, or AIDS) or hereditary (such as severe combined immunodeficiency, or SCID). Immunologists are called in to help treat organ transplantation patients, who must have their immune systems suppressed so that their bodies will not reject a transplanted organ. Some immunologists work to understand natural immunity and the effects of a person’s environment on it. Others work on questions about how the immune system affects diseases such as cancer. In the past, the importance of having a healthy immune system in preventing cancer was not at all understood. To work as an immunologist, a PhD or MD is required. In addition, immunologists undertake at least 2–3 years of training in an accredited program and must pass an examination given by the American Board of Allergy and Immunology. Immunologists must possess knowledge of the functions of the human body as they relate to issues beyond immunization, and knowledge of pharmacology and medical technology, such as medications, therapies, test materials, and surgical procedures. 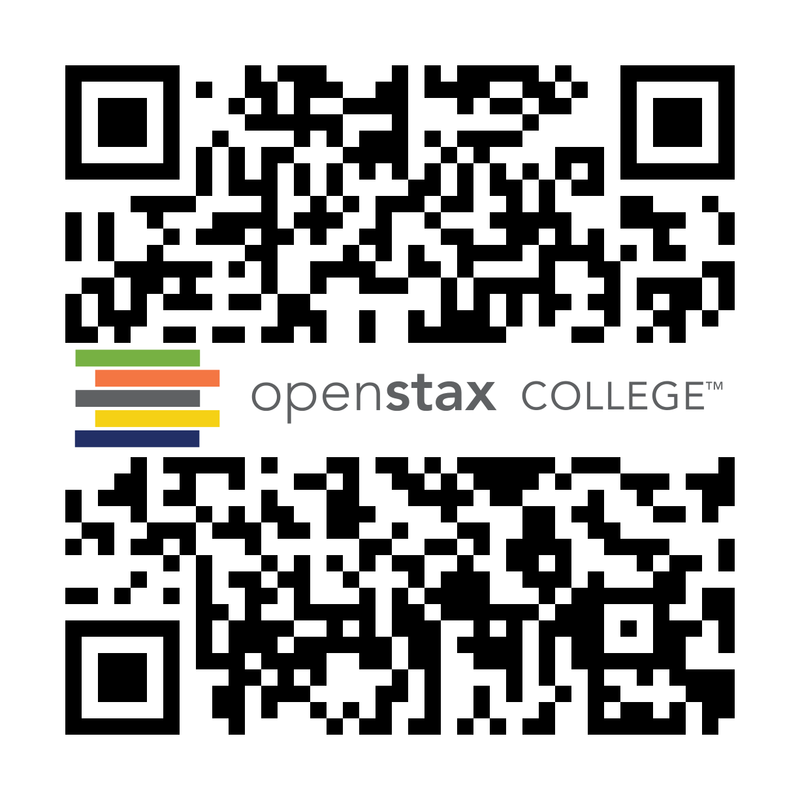 Components and Structure by OpenStaxCollege is licensed under a Creative Commons Attribution 4.0 International License, except where otherwise noted.